It seems like everyone is into sriracha, and I know I’m not alone in my reverence of red pepper flakes, but I’ve got a secret spicy ingredient that somehow seems to be flying under the radar. But it’s time for the secret to get out, I think. Let me introduce you to chiles en adobo. 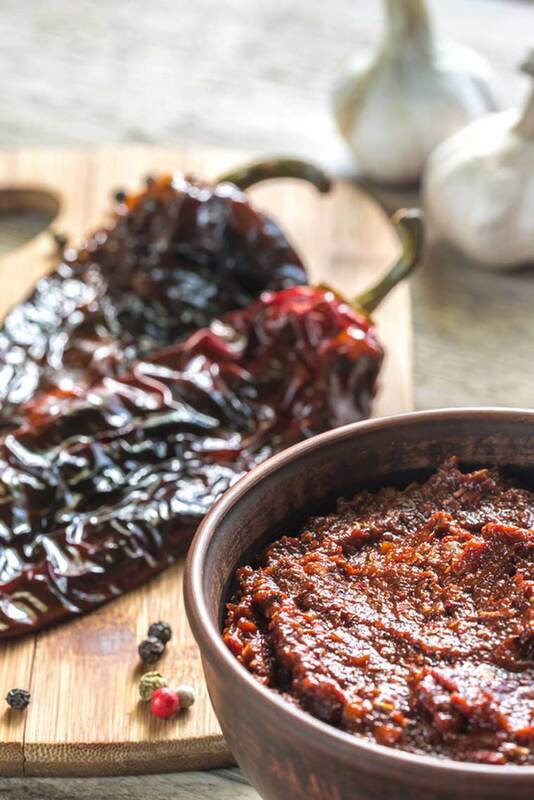 Chiles en adobo are chipotle (aka dried jalapeño) peppers that are positively drowning in a can of spicy, sweet, smoky red sauce. Even the smallest cans on the shelf will contain several peppers. In most grocery stores, the chiles en adobo are in the Mexican food section — and I’ve never had trouble finding them in any grocery store. However, if your supermarket doesn’t have a section specifically for Mexican food, well, first of all I’m sorry, and second, try looking wherever you’d find canned, chopped green chiles, or perhaps with hot sauces or salsas. Sparingly! No, really — even if you like a lot of heat, you might be surprised by how spicy a single pepper or drizzle of sauce can be, so start with just a small amount, knowing you can always add more. I generally dice or mince them before adding them to almost any Mexican, Tex-Mex, or Southwest-influenced food. Tacos, enchiladas, quesadillas, sweet potatoes with black beans and avocado … anything that could benefit from a little chipotle heat will be a perfect match. They don’t need to be cooked, although throwing them into a dish you’re baking won’t hurt ’em. I often hold the sauce aside even once I’ve used all the peppers, especially when cooking for others, so I can drizzle more on as needed. And speaking of setting some aside, it’s reasonably likely you’ll have some left over since each pepper packs such a punch, so you might want to follow these tips from the kitchn for saving and storing your leftovers.